Poinsettias, Orchids, Hyacinths, Planted baskets & bowls. The Christmas Trees are here!! A range of hand selected premium quality non-drop Nordman & Frasier Christmas trees availble for you to choose the pefect tree for your room. Our Poinsettias are all grown in the UK for a premium plant which will last and light up your home for the festive period and beyond. 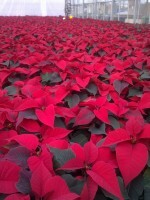 Our Poinsettia are grown for us in the North West by a specialist nursery. They are fetched on slowly over six months at a range of temperatures to produce a stunning well branched plant. Number 1 - buy a good plant in the first place! Always buy a poinsettia from somewhere they are kept in natural light. Never buy a Poinsettia from a draughty display in a doorway. Christmas trees are grown in much the same way as many other crops, planted at a specific time, with a view to harvesting in the future (usually around 5-8 years in the future). For every tree harvested at least two more are planted. During this time the Christmas tree has quite a substantial positive impact on the environment, as well as the obvious - converting carbon dioxide into oxygen. Each Christmas tree converts about 12.25 kg of carbon dioxide into carbon and oxygen per year. Multiply this by the approximate number of Christmas trees growing in Europe alone (400 million +). This means that Christmas tree plantations remove nearly 5 million tonnes of carbon dioxide from the atmosphere each year. From the smallest insects, to birds and larger mammals. They also provide us with an attractive scenic greenbelt, whilst helping to prevent soil erosion and rainwater run off into streams and rivers. The events of early 2007 illustrate what can happen when our rivers cannot cope. Christmas trees also tend to be grown on land that would not be suitable for other conventional crops. DO NOT PUT YOU TREE NEAR A RADIATOR OR OTHER HEAT SOURCE. A Christmas tree needs little in the way of special attention, just follow a few simple steps and it will retain it's colour and shape throughout the Christmas period. Before use, store the Christmas tree outside in cool natural conditions, away from heat until required. Whilst outside you do not need to place it in water. Before you put the tree in your water retaining stand cut about 2cm off the stump so the Christmas tree can take up water. Place your Christmas tree in its spot, away from direct heat and radiators and top up with water. The Christmas tree can drink up to 2 litres a day so check the level. After about 2 weeks the Christmas tree will begin to shut down and will not drink anymore. Treat the Christmas tree as you would a bunch of flowers. We have found that the needle retention sprays that are available are a waste of money. It is more cost effective to purchase a needle holding Christmas tree.